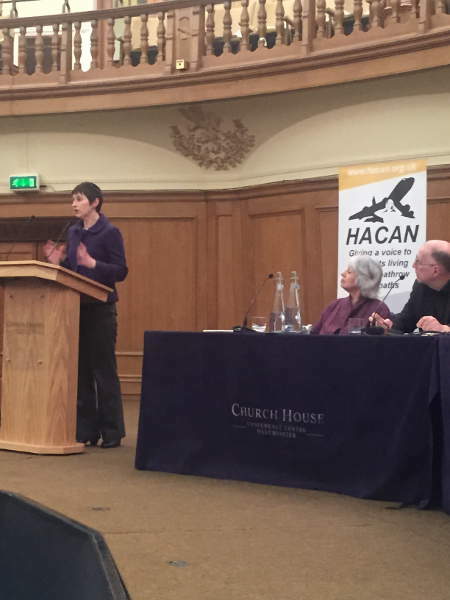 Caroline Pidgeon AM joined Vince Cable MP speaking at a rally organised by HACAN against expansion at Heathrow on Tuesday 3rd March. "Given that there are 725,000 people affected by noise from Heathrow – no other airport in Europe comes close to this figure. AND a new runway would mean an additional 150,000 people under the flight path. It is simply unthinkable that a third runway could be built at Heathrow" commented Caroline. "Existing capacity in the south east must be used more effectively. In summer 2012, 47% of runway slots at Stansted weren’t used, 51% at Luton, and 12% at Gatwick. Instead of a new runway at Heathrow, we should be prioritising improved rail links to the airports that already have spare capacity. It’s good to see that the line to Stansted will be four-tracked in the not too distant future." "Even at Heathrow, though it is full, we know the terminals can handle a further 20 million passengers a year. Heathrow could look to shift to more long-haul flights or larger aircraft to increase passengers." "Given that around 20% of flights at Heathrow are domestic or to/from nearby European destinations – there is obviously scope for a big shift to rail, particularly with HS2." "I don’t see how we can expand airport capacity while meeting our climate change targets. Government figures released recently show that air pollution around Heathrow will still exceed the EU air pollution limits by 2030, without the addition of a third runway. We need to clean up our air not make it worse!" "We can’t be sure that demand for air travel will rise significantly – oil prices, modal shift, and modern ways of doing business all mean that the projected increases in demand are very uncertain." "We don’t need a hub airport. 36% of Heathrow’s passengers transfer. There is no evidence to suggest this number needs to increase to safeguard economic growth. Most of the growth in long-haul aviation is projected to come from direct flights, where hub status would be irrelevant." "Heathrow aren’t afraid of bullying or using shady tactics – the Back Heathrow group has even been accused of counting opponents as supporters! Heathrow have spent millions on advertising and lobbying the Government – I even had a sponsored tweet from them today – I reported it as being offensive. "Their pockets might be deep, but their arguments are shallow. We won’t be bullied. "Liberal Democrats are against any airport expansion in London and the South East, and we have been fighting on this issue for decades. I will continue to campaign with Vince Cable, Robin Meltzer, Ed Davey and others to make sure there is no third runway at Heathrow."